The Daily Telegraph has compiled a list of 80 great quotes about love and romance, from Adam and Eve to chemsex. 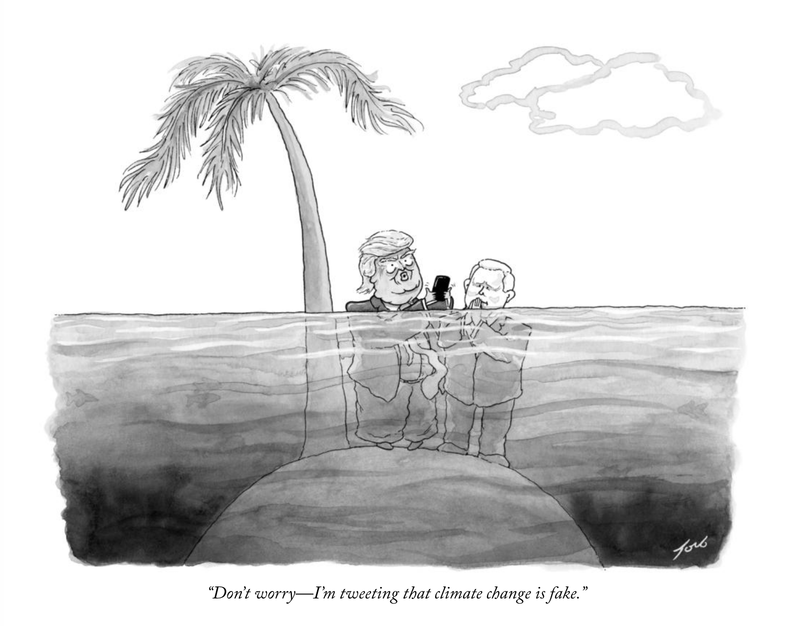 Thanks to The New Yorker's Tom Toro, we now have a Donald Trump-era update of the leftist editorial cartoons that are hilarious except for the inconvenient fact that they seem to be based upon little, if any, substantial reality. Like cartoonists around the world, [The Economist's] Kal has drawn GOP elephants mocking activists' fears even as they are forced to climb onto the rooftop of such buildings as the US Congress [and the White House] because of the rising waters. Thousands of [leftists] are howling in outrage as they read this … and as I go on to ask: So who are truly the irrational people here? Isn't science supposed to require the challengers of the status quo to prove their contention? • Editorial Cartoons: Are They Humor or Are They Propaganda? So on Monday, February 6, Instapundit admitted that, contrary to reports that seemed to depict the iconoclasts of the Front National as perhaps a French equivalent to the members of America's tea party movement, Marine Le Pen turns out to be really quite Left-wing. Stephen Green authored the post after seeing a news item penned by the usually reliable Daniel Hannan. Of course, this is hardly news to No Pasarán. Being a blog whose primary focus, when it debuted 13 years ago, was France and foreign anti-Americanism (the internal danger from the last eight years did change the focal point somewhat), many of whose bloggers through the years have been based in Paris — along with its sister (mainly French-language) blog Le Monde Watch — we have been reporting on the Le Pen clan and its party for years. Throughout the years, No Pasarán and Le Monde Watch have reported on such various news items (most of them from the French newspaper of record, Le Monde) as the Front National's Marine Le Pen criticizing privatization and "extreme" free market policies, on her opining that France needs "a strong state", and on one of her top aides speaking of taking advantage of the fears engendered by globalization and surfing on insecurity and on social suffering. Meanwhile, one leftist leader got incensed when journalists suggested that the Left and the extreme right's Le Pen family are fighting over the same (anti-capitalist) backyard. Indeed, in 2015 one libertarian critic was led to ask, Is the Le Pen Party Extreme Rightist or Is It Actually a Reincarnation of the Communist Party? Moreover, a Harris poll in the Fall of 2012 found that members of the Front National supported Barack Obama over Mitt Romney in that year's election by almost 3 to 1 (70% vs 26%). Last but not least, there is Marine Le Pen's assertion that France Should Leave NATO, "Turn Its Back" on the American "Hyper-Power", and "Turn Towards Russia". The post that summarizes all the rest is perhaps a No Pasarán item from the Spring of 2011, detailing the time when a New York Times reporter attempting to write an in-depth portrait on Marine Le Pen reported that, to his utter surprise, the economics of the leader of France's French "far-right party" turn out to be "frankly leftist"! Since at least the Spring of 2011, just about every time that the daughter of Jean-Marie Le Pen has been mentioned on the internet (certainly if the coverage was positive), we sent emails to the blogger(s) involved and/or left messages in the appropriate comments section (if applicable) referring to the above-mentioned post with the NYT's in-depth portrait of Marine Le Pen and warning that the members of her Front National may not be the equivalent of America's tea partiers, while Marine herself may be no Geert Wilders and, certainly, no Nigel Farage (as the British iconoclaust pointed out himself by refusing to link his UKIP with her FN). Of course, 10 years ago, a Le Monde interview with Michael Moore revealed the amazing (albeit hardly surprising) news that the director of Sicko and Capitalism (A Love Story) admits in so many words — "Dude, I am on Marx's Tomb!" — to being nothing less than… a full-grown Marxist(!). Ten years of attempting to contact American bloggers (again, by mail and/or in the comments section) every time Moore was in the news and/or mentioned in a post with this earth-shattering admission has likewise failed to register. We don't know if we sometimes go overboard trying to contact you. Possibly we have, once or twice. But, generally speaking, we have tried to send you no more than one email or at most two emails a month. All we wish to do here is join in spreading the good word and fighting the good fight. Or, certainly, hand the ammunition to the band of brothers in the front-lines fighting the good fight. It's simply, especially when we sometimes discern that our ammunition is occasionally of a particularly potent mixture, that we wish you would reach out and take the ammunition that we hand to you. Speaking of really good, outstanding material: Last week, we found on a friend's Facebook page of all places — by a denizen from flyover country (in Tennessee, no less) — what we truly and honestly believe to be the very best singular statement (and not only of the past year) on Donald Trump's so-called Muslim ban, on immigration in general, on America's character, on the Statue of Liberty, and on the true and full meaning of the Emma Lazarus poem at its base. … I am against allowing those who want to change our country. I'm against those who are coming not with the intention of assimilating into a free society but rather to establish a society like they left. The poem doesn't protect those who are coming to our shores to recreate the life they left. In fact it says the opposite. "What exactly is the success that the Democrats are trumpeting?" Asks France's Far Left Weekly; "What remains of the Obama inheritance?" From Marianne, one of the most left-leaning weeklies in France, comes this jewel from Stéphane Trano. What exactly is the success that the Democrats are trumpeting? … What remains of the Obama inheritance? … A president is measured by the impact that he leaves behind him, not on his performance on the scene of power. … Apart from that health law which is nowhere near the generous and egalitarian system that Europeans think it is, there is emptiness… [On the international scene], the memories of all are still fresh enough to remember that the eight years of this president were those of great diplomatic and military hypocrisy. But denial, in this area, as in others, is stronger than remembrance. … America is lucky in that it is a pragmatic society: by bringing the Republicans back to power, against all expectations, it has flanked a magisterial slap in the face of the "progressives" who believed that everything was allowed them. It did so not out of madness or irresponsibility, but because it has confidence in the capacity of its institutions to "absorb" this type of democratic choice, however disturbing it may be for those who consider themselves better educated and more enlightened than others. This is called alternation, a banality that the Democrats now want to call a scandal and a catastrophe. On ne peut pas blâmer les Démocrates américains de tenter, par tous les moyens, de masquer la portée de leur échec en l’attribuant à toutes sortes de motifs, même les plus fantaisistes. La pilule est certes amère. Toutefois, la part la plus intéressante de cette hystérie collective est le phénomène d’auto-persuasion qui en est le moteur et que la plupart des grands médias du pays alimentent. L’argument numéro un des perdants est la faillite du système électoral et, en particulier, le fait que la candidate démocrate, Hillary Clinton, a remporté le scrutin populaire. C’est oublier que la situation, même si elle n’est pas commune, s’est produite à quatre reprises au cours de l’Histoire des Etats-Unis, et qu’elle ne constitue pas de difficulté particulière aux termes de la Constitution. De plus, le 115ème congrès, sorti des urnes le 8 novembre 2016 et en fonction depuis le 3 janvier 2017, a vu 52% des électeurs voter pour les Républicains au Sénat et 55% à la Chambre des représentants. Il n’y a donc aucune anomalie dans les élections de 2016 de ce point de vue. Le second argument est celui du piratage informatique à grande échelle des élections, sur ordre du président russe Vladimir Poutine, afin de faciliter l’élection de Donald J. Trump. Là encore, l’idée ne tient pas debout. Aucune trace de défaillance dans le nombre limité de votes électroniques aux élections n’a été décelée. Les services du renseignement américain, en dépit de leur conviction affichée selon lesquelles il existe un indice « haut » de confiance dans le fait qu’il y a eu piratage, ne sont pas tenus de produire le moindre élément de preuve au public, puisque de telles informations sont par essence classées « secret défense ». Il faut donc les croire sur parole. Hillary Clinton n’a eu besoin ni de Vladimir Poutine, ni de Julien Assange et encore moins de « pirates » pour perdre les élections de 2016. Ce ne sont pas de prétendues « fausses » informations qui ont heurté sa réputation déjà bien entamée auprès de nombreux électeurs américains, par exemple, dans l’affaire des emails, mais au contraire, son refus obstiné de prendre cette affaire au sérieux et de répondre aux interrogations. On ne voit pas, non plus, quelles « fausses » informations ont poussé l’électorat noir américain à se sous-mobiliser lors du vote du 8 novembre, ou les femmes et les plus jeunes à bouder sa candidature, après la défaite de Bernie Sanders lors des primaires démocrates. Hillary Clinton, dont l’ambition n’est pas éteinte par la défaite, a affiché un visage froid, autoritaire et cassant, durant sa campagne. Elle n’a pas su développer un programme à la fois lisible et crédible, qui aurait pu emporter un vote, à la fois populaire et du collège électoral, si tranché qu’il n’y aurait eu aucune contestation. Comment, en effet, se revendiquer de l’héritage de Barack Obama, lorsque cet héritage peine à brandir autre chose que l’Obamacare, dont même les démocrates savent qu’il n’est pas financé au-delà de 2017 et coûte, en réalité, une fortune au regard des bénéfices qu’il apporte ? Car au-delà de cette loi sur la santé qui n’est en rien un système généreux et égalitaire tel qu’on le pense du côté des Européens, c’est le vide. Même si le Secrétaire d’Etat John Kerry blâme ces derniers jours le gouvernement anglais, prétendant qu’il est à l’origine de l’incapacité d’Obama à agir plus concrètement et durablement au Moyen-Orient contre l’état islamique, la mémoire de tous est par chance encore assez fraîche pour se souvenir que les huit années de ce président ont été celles d’une grande hypocrisie diplomatique et militaire. Mais le déni, dans ce domaine comme dans bien d’autres, est plus puissant que la mémoire. Les âmes sensibles sont outrées par l’idée de construire un mur à la frontière entre les Etats-Unis et le Mexique. On a beau leur montrer les mille kilomètres de ce mur déjà construit, y compris sous le premier mandat d’Obama, cela n’a guère d’effet et n’entraîne aucune interrogation sur les raisons pour lesquelles le bon président n’en n’a pas retiré une seule pierre. Un autre exemple est celui de la crise financière de 2008 et du retour au « plein emploi » huit ans plus tard : quel président n’aurait point réussi ce « prodige » en creusant le déficit de son pays, comme Barack Obama l’a fait, de près de 5000 milliards de dollars ? La période 2008-2016 n’a pas non plus été celle de législations majeures en matière d’armes à feu, d’incarcérations, de recul de la peine de mort, de maîtrise des frais de scolarité ou de gestion des prêts étudiants parvenus à des hauteurs astronomiques. Quel est donc ce succès dont les Démocrates se revendiquent au juste? Est-ce celui des villes défigurées sous les coups de boutoir du géant Amazon, à la fois propriétaire du puissant Washington Post et importateur massif de toutes les chinoiseries possibles qui inondent un marché américain ou l'on ne sait plus fabriquer une chaussette? Alors, que reste t-il de cet héritage Obama, au juste ? Une posture, bien évidemment. Après George W. Bush et le mensonge irakien, n’importe quel président aurait été auréolé de gloire. On attendait d’Obama, toutefois, un peu plus qu’un physique avenant, un talent rhétorique et l’humour dont il a tant usé. Car c’est à ce que laisse un président que l’on mesure son impact, pas à sa performance sur la scène du pouvoir. L’Amérique n’est pas plus sympathique dans le monde qu’elle ne l’était avant son arrivée, ni plus sûre, ni plus égalitaire. Mais elle a la chance d’être un pays pragmatique : en ramenant au pouvoir, contre toute attente, les Républicains, elle a flanqué une gifle magistrale aux « progressistes » qui se croyaient tout permis. Elle ne l’a pas fait par folie ou par irresponsabilité mais parce qu’elle a confiance dans la capacité de ses institutions à « encaisser » ce type de choix démocratique, si perturbant soit-il pour des milieux qui s’estiment mieux éduqués et éclairés que les autres. On appelle cela l’alternance, une banalité que les Démocrates veulent aujourd’hui faire passer pour un scandale et une catastrophe. Courtesy of the Daily Telegraph, we are pleased to present to you Boris Johnson's finest moments on camera. Remember that, prior to becoming the UK's foreign secretary, the London mayor was hounded by the IRS to such an extent that, in 2015, he into gave up the U.S. half of his dual citizenship.